The Limpopo Province Nylsvley Nature Reserve is managed by Limpopo Department of Economic Development, Environment and Tourism. Limpopo Tourism Agency is responsible for hospitality. 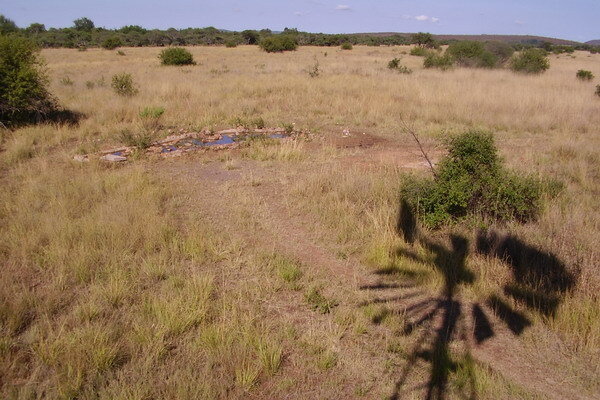 This 4000 ha reserve is a mosaic of habitats: Acacia, Combretum and broad leafed woodland and grassveld floodplain. It lies between 1080 and 1155 m above sea level and receives an average of 620mm rainfall per annum. Summers are hot, winters mild with occasional very low temperatures. Very nearly 400 species of birds are known to reside or visit occasionally, including 102 water bird species. About 800 plant species support the biodiversity that makes Nylsvley famous. Nylsvley is a Ramsar site, a wetland of international importance for the protection of waterfowl. It was the subject of the acclaimed Savanna Biome Research programme from 1974. The ephemeral (impermanent) Nyl floodplain, of which Nylsvley is a part, is 70km long extending from Kranskop Mountain (near Modimolle) in the south ending at Moorddrift near Mokopane. When fully inundated it can be 7 km wide and covers 16 000ha. Apart from Nylsvley the rest of the floodplain is privately owned. The water supply comes from the eastern slopes of the Waterberg Mountains, the streams entering the floodplain at intervals along its length. Spoonbill Restaurant/Tea Garden serving breakfast light lunches, supper by arrangement. 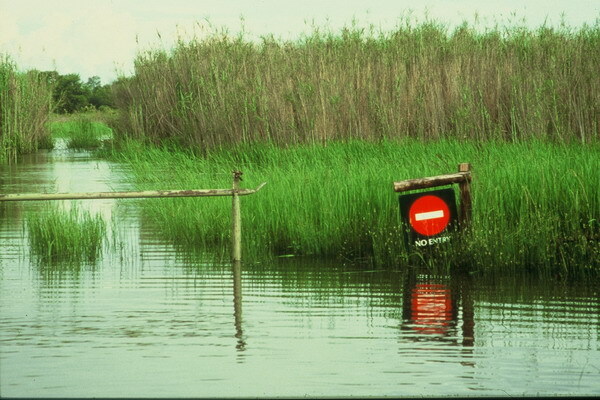 Nylsvley Nature Reserve was designated a Ramsar site in July 1998. Ramsar is an international convention that recognizes and urges protection of globally important wetlands. The reserve is one of about 20 sites registered in South Africa and one of 2065+ in the world. Nylsvley, as part of the Nyl River floodplain is listed by BirdLife International as an “Important Bird and Biodiversity Area”. This recognition stems from the variety and abundance of waterbirds that are attracted to the floodplain during times of flooding. More than 100 water bird species have been recorded – more than that recorded in any other South African wetland. Many of these species are rare or highly localised elsewhere in the country – for example, the Eurasian Bittern, Rufous-bellied Heron, Dwarf Bittern, Allen’s Gallinule and Streaky-breasted Flufftail – and Nylsvley is an important breeding ground for them in wet years. Nylsvley is not just about waterbirds; the 380+ species recorded makes it one of the most bird-rich reserves for its size, in South Africa. 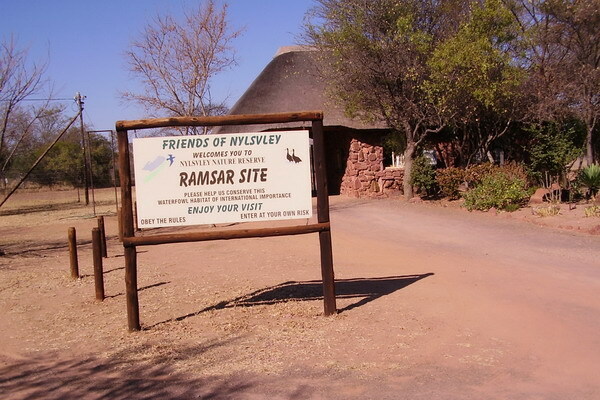 Nylsvley was purchased in 1974 by the Provincial Government with the primary purpose of conserving a section of the floodplain as a breeding station for Roan and Tsessebe; it was proclaimed a nature reserve in the same year. The reserve lies between 2436S/2840E and 2442S/2844E and straddles the floodplain near the towns Modimolle (Nylstroom) and Mookgophong (Naboomspruit). The reserve is 3975 ha in extent and lies at an altitude of 1080-1155m above sea-level; it receives, on average, 620 mm of rain per annum. Summers are warm to hot (max temp 38-390C), winters are mild to warm with temperatures rarely dropping below zero. Plant communities on Nylsvley are diverse and interesting; the plant checklist currently stands at about 600 species. Among them is rice grass Oryza longistaminata, the dominant grass on the floodplain, a species that is virtually absent elsewhere in the country. Acacias are the dominant tree species in the alluvial soils fringing the floodplain, with Acacia tortilis, A. nilotica and A. karoo being the main species, along with lovely old examples of the shepherd’s tree Boscia albitrunca, dense thickets of the Num num Carissa bispinosa and fine examples of Jacket plum Pappea capensis and bushveld saf¬fron Eleaodendron transvaalense. The southern part of the reserve is underlain by sandstone and resulting sandy soils support broad-leafed woodland dominated by the red syringa Burkea africana, silver cluster ¬leaf Terminalia sericea, the lekker breek Ochna pulchra, and others. 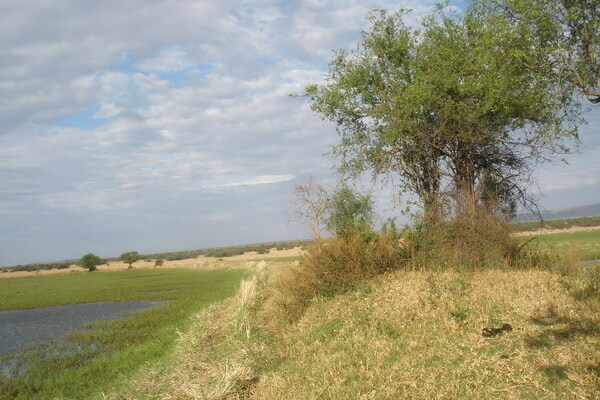 The northern side of the floodplain is underlain by erosion-resistant felsities resulting in rocky shallow soils, with Combretum species dominating the tree community – C. apiculatum, C. erthropyhllum, C. molle and C. zeyheri. Also occurring are mature specimens of beechwood Faurea saligna and the giant Naboom Euphorbia ingens. The reserve’s mammal list currently numbers 79 species of which the most commonly seen are Giraffe, Blue Wildebeest, Zebra, Roan Antelope, Kudu, Waterbuck, Reedbuck, Bushbuck, Tsessebe, impala, Warthog, Black-backed Jackal, Vervet monkey and Tree Squirrel. The nocturnal species include Bushpig, brown Hyena, leopard, porcupine, lesser Galago (or Bushbaby), aardwolf, aardvark, scrub and Cape hares, and Jameson’s red rock rabbit, springhare, Serval and Caracal, African Molerat and striped Polecat. You could also encounter Hedgehog, clawless Otter, slender, banded, yellow, white-tailed and marsh Mongoose, Juliana’s Golden Mole and large spotted Genet. Less commonly seen; wild Cat, plus 9 species of Bats, 9 of Mice, 5 Rat species, 5 Shrew species plus a Dormouse and a Gerbil. Amphibians are well-represented with 19 frog species, of which the largest is the Giant Bullfrog Pyxicephalus adspersus. They come out of hibernation as soon as the wetland is inundated to breed in the ephemeral puddles along the floodplain margins where there is less likelihood of fish eating their tadpoles. Another noisy frog is the raucous toad, and the most colourful is certainly the banded rubber frog. Apart from a crocodile that resided at Vogelfontein for a while, a few years ago, the largest reptile present is the water monitor; it contributes to an impressive 58 species of reptiles and amphibians present in Nylsvley. 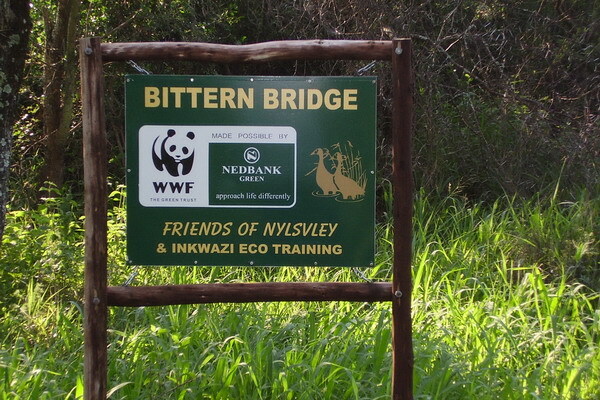 The list includes a diverse complement of snakes, including python, black mamba, snouted (or Egyptian) cobra, puff adder, boom-slang and vine snake: their presence dictates that sensible shoes be worn when walking in the reserve. Given the ephemeral nature of the floodplain, Nylsvley’s fish fauna is restricted to a dozen or so species, but what it lacks in variety, it makes up for, when in flood, in quantity. The first floodwater brings with it thousands, if not millions, of barbel and minnows riding the water coming down from the catchment, heading for the floodplain to breed. When it floods, their numbers, and the numbers of waterbirds eating them, are one of Nylsvley’s memorable sights. 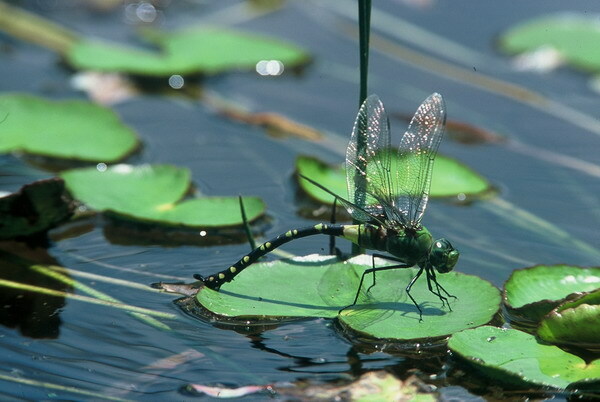 Finally, Nylsvley is home, when wet, to at least 55 species of dragonflies. Apart from these beautiful wetland ambassadors, 194 butterfly species have been chalked up. Other insect groups have been less well catalogued, but they could number up to 10 000 species. Nylsvley is very proud of its biodiversity. THE NYL RIVER FLOODPLAIN is one of South Africa’s largest and least impacted floodplain systems. It is located in the upper-reaches of the Mogalekwena River, a tributary of the great Limpopo, and stretches over a distance of about 70 km, reaching 7 km at its widest point. In years of exceptional rainfall the area under water may extend up to 16 000 ha. The primary sources of water are small seasonal rivers that drain from the eastern slopes of the Waterberg range including the Olifantsspruit, Groot and Klein Nyl rivers. The floodplain is not permanently under water; indeed it is dry almost as often as it is wet. The timing and extent of inundation is rainfall-dependent, and years of below-average rain often result in no floodwater reaching the floodplain. On average, this is the case one year in three, while flooding occurs to a greater or lesser extent in two years in three. Only once in about ten years is there a bumper flood that results in the entire floodplain being under water. Inundation typically occurs in late January and February; the water then gradually recedes, sometimes drying up completely before the next summer. Management of habitats for all fauna, the waterfowl habitat is managed as such and provision is made for management of specially protected bird species. Maintenance of roads, fences and buildings and weather monitoring equipment. Alien plant and animal eradication, control of illegal activities and community engagement. All developments are done in accordance with the Ramsar status and all treaties to which South Africa is a party. The pertinent legislation is revised 5 yearly so as to include new research results. Bird, mammal and other list supplied separately. Bicycle hire R40 per hour.